If cool shoes and clothes are important to you, then you already know all about this store. But what you might not know is that now you can buy a discounted Journeys gift card. That’s right! You can now save money in a-rockin’ hip store! And when I say this store carries some of the hippest gear around, I certainly mean it. And with name brands such as Billabong, Lucky Brand, Toms, UGG, Vans and more, you will find all your favorite styles. From socks & slippers to Birkenstocks, your discounted card will stretch your dollar further than ever before! And I’m not just talking shoes. Your discounted Journeys gift card will save you money on your entire purchase. Which is excellent news because they also have backpacks, clothes, hats, and lots of fabulous accessories! What’s more, they carry shoes, clothing, hats, and accessories for men and women of all ages. From Peanuts gear for your toddler to Vans shoes for your teen, you can get more great merchandise without breaking the bank! Founded in 1924, today there are more than 1,000 stores across North America. And your discounted Journeys gift card can be used in any of these locations. So, the next time you visit the mall, grab your card and shop for less. Once done, you can use any remaining balance during your next trip to the mall. It’s just that easy! And don’t forget what great presents gift cards make! Why not surprise your teenager with the gift of shopping in the store that’s sure, please? 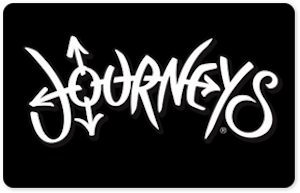 Your Journeys gift card is your ticket to savings on cool shoes, clothing, and accessories! But the savings don’t end there! Cards2Cash carries lots of gift cards. If you would like to save money in other retail shops and restaurants, be sure you check out our listings for Lids, Forever 21, Altar’d State, Diesel, and more! Cards2Cash is your good thing for saving money! If you have a Journeys gift card and you’re sure you will not use it, then why not sell it to us? Cards2Cash pays top dollar for gift cards to many favorite retailers and websites! Why keep a piece of plastic in your wallet when instead you can have cold hard cash? If you have a card you want to sell, stop by one of our retail locations, and we will pay you money on-the-spot for your unwanted card OR just fill out our online form, and we’ll get back to you shortly with an offer! Cards2Cash is your one-stop gift card shop!